Brainstorming is a method for generating ideas to solve a design problem. It usually involves a group, under the direction of a facilitator. The strength of brainstorming is the potential participants have in drawing associations between their ideas in a free-thinking environment, thereby broadening the solution space. Watch how to get serious, and fun, results with Brainstorming. Brainstorming is an extremely popular ideation technique for design teams because of the freedom they have to expand in all directions, using out-of-the-box and lateral thinking in search of the most effective solutions – rough answers they’ll refine later. Marketing CEO Alex Osborn, brainstorming’s “inventor”, captured the refined elements of creative problem-solving in his 1953 book, Applied Imagination. In brainstorming, we aim squarely at a design problem and produce an arsenal of potential solutions. By not only harvesting our own ideas but also considering and building on colleagues’ notions, we cover the problem from every angle imaginable. It is easier to tone down a wild idea than to think up a new one. Before a design team gather (preferably in a room with a large board/wall for pictures/Post-Its) for a brainstorming session, the target problem must be clearly defined. A good mix of participants will expand the experience pool, thus broadening the idea space. Brainstorming may seem to lack constraints, but success depends on the observance of eight house rules and someone acting as facilitator. Set a time limit – depending on the problem’s complexity, 15–60 minutes is normal. Begin with a target problem/brief – members should approach this sharply defined question, plan or goal and stay on topic. Refrain from judgment/criticism – no-one should be negative (including via body language) about any idea. Encourage weird and wacky ideas – further to the ban on killer phrases like “too expensive”, keep the floodgates open so everyone feels free to blurt out ideas, as long as they’re on topic. Aim for quantity – remember, “quantity breeds quality”; the sifting-and-sorting process comes later. Build on others’ ideas – it’s a process of association where members expand on others’ notions and reach new insights, allowing these ideas to trigger their own. Say “and”—rather than discourage with “but”—to get ideas closer to the problem. Stay visual – diagrams and Post-Its help bring ideas to life and help others see things in different ways. Allow one conversation at a time – keeping on track this way and showing respect for everyone’s ideas is essential for arriving at concrete results. Capturing ideas in brainstorming sessions means someone plays “scribe”, marking every idea on the board. Alternatively, write down your own ideas as they come, and share these with the group. Often, design problems demand mixed tactics: brainstorming and its sibling approaches – braindumping (for individuals), and brainwriting and brainwalking (for group-and-individual mixes). Brainstorming involves harnessing synergy – we leverage our collective thinking towards a variety of potential solutions. However, having boundless freedom presents challenges. In groups, introverts may stay quiet while extroverts dominate. Whoever’s leading the session must “police” the team to ensure a healthy, solution-focused atmosphere where even the shiest participants feel fearless about speaking up. Likewise, a warm-up activity can cure brainstorming “constipation” – e.g., asking participants to list ways the world would be different if metal were like rubber. Another risk is letting the team stray off topic and/or address other problems. As we may use brainstorming in any part of our design process—including areas related to a project’s main scope—sticking to the problem relevant to that part (what Osborn called the “Point of View”) is vital. Similarly, framing problems with “How Might We” questions helps us remember brainstorming is organic and free of boundaries. Overall, brainstorming involves staying fluid in our search for ways we might resolve an issue, not chasing a “holy grail” solution developed elsewhere. The idea is to mine idea “ore” and refine “golden” solutions from it later. Brainstorming is the most frequently practiced form of ideation. We recommend that you use it along with Brainwriting, Brainwalking, and Braindumping. Here, you’ll learn the best practices from the very best experts from d-school and IDEO as well of the father of the Brainstorming technique, Alex Osborn. Brainstorming is a great way to generate a lot of ideas that you would not be able to generate by just sitting down with a pen and paper. The intention of brainstorming is to leverage the collective thinking of the group, by engaging with each other, listening, and building on other ideas. Conducting a brainstorm also creates a distinct segment of time when you intentionally turn up the generative part of your brain and turn down the evaluative part. You can use brainstorming throughout any design or work process, of course, to generate ideas for design solutions, but also any time you are trying to generate ideas, such as planning where to do empathy work, or thinking about product and services related to your project. Here, you’ll learn the best practices from the very best experts from d-school and IDEO as well of the father of the Brainstorming technique, Alex Osborn. IDEO is a hugely successful international design and consulting firm, which uses the Design Thinking methodology to advance innovative design in products, services, environments, and digital experiences. The d.school celebrates Design Thinking, and it’s one of the most – if not the most – celebrated and recognised sources on Design Thinking and ideation techniques. d.school is a design school based in Stanford University in cooperation with the German Hasso Plattner Institute of the University of Potsdam. Brainstorming (or just ‘brainstorm’, for short) has remained the cornerstone of the creative industry for decades and has evolved over the years as experience and learning developed from its variety of applications. Brainstorming essentially relies on a group of people coming together with their prior knowledge and research in order to gather ideas for solving the stated problem. It evokes images of exploration, experimental thinking, and wild ideas. However, all too often it takes the form of controlled sessions where dominant figures assert themselves over others and creativity ends up getting stifled. Or, in other cases, the facilitator does not succeed in helping the team steer towards the goal by keeping the user, the user’s need and the team’s insights about them in a problem statement – also called Point Of View – at the front of the team’s minds. In the following, we’ll let you in on some amazing brainstorm rules which will help keep you from falling into these traps, and instead facilitate innovative and effective brainstorming sessions. Idea generation, or Ideation, is an art form, which is dependent on appointing an experienced facilitator and having an experienced team. However, we’re all here to learn, and here is how you can start learning to become a successful facilitator of brainstorming sessions. Brainstorming is about setting a safe, creative space for people to feel like they can say anything and be wild—and know that they will not be judged for doing so—so that new ideas can be born. The following are some rules, principles, and suggestions so you can make brainstorming sessions much more user-oriented, effective, innovative – and fun. d-school emphasises that the facilitator has to be intentional about setting aside a period when your team will be in “brainstorm mode”. In this time frame, it’s the sole goal to come up with as many ideas as possible, and during this period judgements of those ideas are prohibited. Typically, a Brainstorm will take around 15-60 minutes. It can be shorter or longer, depending on the difficulty of the problem and the motivation and experience of the group. Alex Osborn, the father of the Brainstorming technique, emphasises that brainstorming sessions should always address a specific question or problem statement (also called a Point of View) as sessions addressing multiple questions are inefficient. Begin with a good problem statement or question. Design Thinkers and other ideation specialists have further developed this approach into the art of framing problem statements via methods. Specifically, these are “How Might We” questions. The facilitator should always set a positive, unthreatening tone and tell participants to reserve criticism for a later critical stage in the ideation process. A Brainstorming session is not the time and the place to evaluate ideas, and you should avoid executional details. It’s crucial that participants are feeling confident by being in a safe environment so they have no fear of being judged by others when they put forward wild ideas. You should create equal opportunities for all participants. The best ideas often come from practitioners, students, and people who dare to think differently – and not necessarily only from the highly skilled and experienced managers. Best practice tip: The facilitator should suspend judgement. This way, participants will feel free to generate unusual ideas. As a facilitator, you will find that it can even be a great idea to prohibit the word “no”. You’ll be surprised to see how effective this tool is and how it helps open up minds and creates a collaborative, curious, and friendly ideation environment. And you’ll find that it’s pretty fun too when team members have to initially say “yes” to even the weirdest ideas. Giving out half-thought-out ideas or strange suggestions is normally not socially accepted, is socially frowned on and leads to people holding back in normal situations. Brainstorming deliberately gives permission to be “stupid” and “child-like”. These new ways of thinking might give you better solutions. Aim for as many new ideas as possible. The assumption is that the greater the number of ideas you generate, the bigger your chance is of producing a radical and effective solution. Brainstorming celebrates the maxim “quantity breeds quality”. As suggested by the slogan "1+1=3", Brainstorming stimulates the building of ideas by a process of association. Embrace the most out-of-the-box notions and build, build, build. Be positive and build on the ideas of others. Brainstorming works well when participants use each other's ideas to trigger their own thinking. Our minds are highly associative. One thought easily triggers another. When we use the thoughts of others, then these will stop us getting trapped by our own thinking structures. Best practice tip: Try to say and encourage others to say “and” instead of “but”. It takes practice, but this little trick works surprisingly well. 1. Scribe: the scribe legibly and visually captures on the board ideas that team members call out. It is very important to capture every idea, regardless of your own feelings about each idea. Listen to each other and elaborate on each other’s ideas. Don’t get obsessed with your own ideas. You’re here to ideate together. Brainstorm, as great as it can be, has some obvious weaknesses, most of them human factors. Whenever a group of people gets together to work collectively on anything, we inevitably find some members dominating over others. Introverts take a back seat and prefer working away in a quieter self-reflective manner, while extroverts, especially egoistical ones, put a stake in the ground and try to own the show. Research published in the Administrative Science Quarterly in 1958, Does Group Participation When Using Brainstorming Facilitate or Inhibit Creative Thinking?, seeks to understand whether individual brainstorming or group brainstorming sessions produce better results. A storm of debate ensued in 2010 when News Week posted an article referencing this research and making a call to "Forget Brainstorming "with others rebuffing this claim and affirming "Don't Forget: Brainstorming Works". Though the results of the study were based on limited parameters, they do indicate that if group-brainstorming conditions are not properly met, they can fail more easily. We agree that poorly facilitated face-to-face brainstorms do stifle creativity. We agree that, even when brainstorming is done right, people could sometimes still generate ideas faster when they work alone. However, if you want creativity, it’s a major mistake to keep your team members in solitary confinement where they can’t “waste time” listening to and building on the ideas of others. Here’s the problem: Most pieces of research on brainstorming are rigorous but irrelevant to the challenge of managing creative work. For starters, comparing whether creativity happens best in groups or alone is pretty silly when you look at how creative work is actually done. At creative companies like IDEO, people switch between both modes so seamlessly that it is hard to notice where individual work ends and group work starts. Should Your Team Brainstorm as a Group or as Individuals? Best practice: Switching between the two modes of individual and collective ideation sessions can be seamless—and highly productive. Alex Osborn’s 1950s classic Applied Imagination gave advice that is still relevant: Creativity comes from a blend of individual and collective ideation. Brainstorming (group sessions) has three siblings which you should get to know: Braindumping (individual sessions), Brainwriting (a mix of individual and group sessions) and Brainwalking (another mix of individual and group sessions). It’s often a good idea to do individual ideation sessions like braindumping, brainwriting and brainwalking before and after brainstorming group sessions. One of the best ways to progress to more advanced levels of ideation is to start by getting everything that's currently clogging the neural pathways out in the open and freeing up some cognitive space for other synapses, connections, and mixtures to get through. David Allen, author of the world famous “Getting Things Done” methodology, swears by the braindump as a means to free up mental energy and allow freethinking. Holding onto your own thoughts, unfinished tasks, or unexplored ideas creates mental blockages and prevents freethinking. Furthermore, Braindump is an amazing technique to help quiet employees get a voice. If you were the facilitator, you’d brief ideation participants upfront on the problem statement, goals and important insights from previous research and findings. Then ask all participants to write down their ideas as they come. It’s important that each participant does this individually – and silently. Provide participants with sheets of paper, idea cards or traditional Post-it notes. 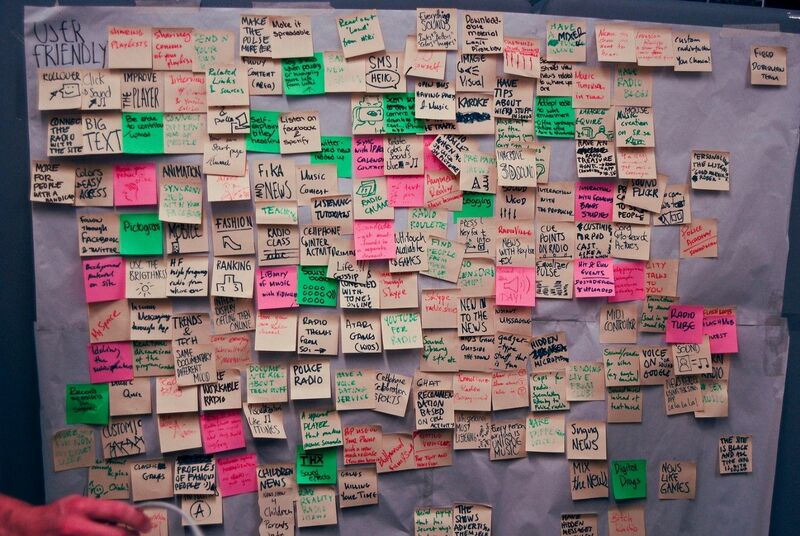 Sticky notes are great, because they allow people to write their ideas down individually – one idea per note. Give participants between 3 and 10 minutes to get ideas they have been thinking of off their chests. After reaching the time limit of approximately 3-10 minutes, each participant will say a few words about his or her ideas and stick them on a board or wall. You should avoid initial discussions about notes when team members are presenting them. Ideas that come out of early braindump sessions should be shared verbally with the entire team in order to spark new streams of thinking or combinations of ideas. While sticking the ideas up and presenting them, the group will also group duplicates together. 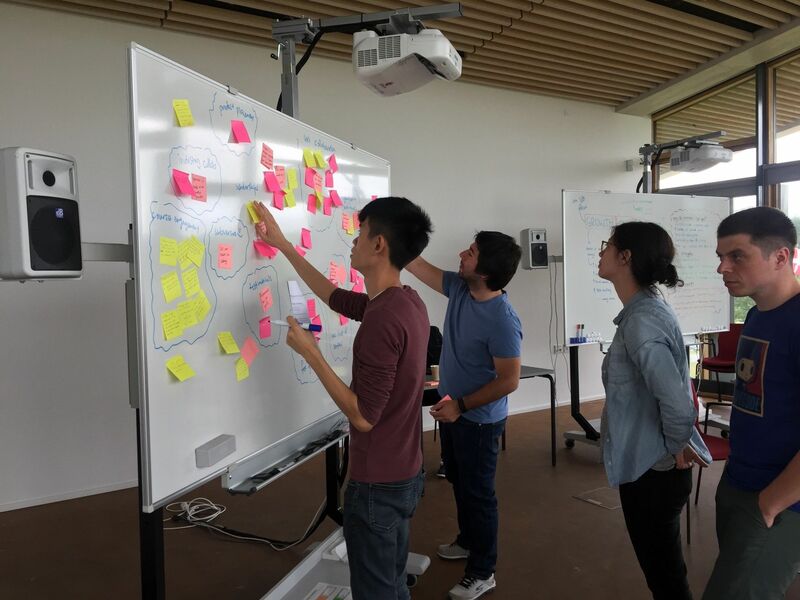 When all team members have presented their ideas, you can select the best ideas, which you can continue to build and elaborate on in other ideation sessions. There are various methods you can use such as “Post-it Voting”, “Four Categories”, “Bingo Selection”, “Six Thinking Hats”, and “Now Wow How Matrix”. Sticky notes are great for braindump sessions, because they allow people to write their ideas down individually – one idea per note. After reaching the time limit of approximately 3-10 minutes, each participant will say a few words about his or her ideas and stick them on a board or wall. Brainwriting is a technique where participants write ideas onto cards and then pass their idea cards on to the next person, moving those cards around the group in a circle as participants build on the ideas of others. Participants perform this technique in complete silence—and they are forced to build on, instead of criticise, other participants' ideas. The cycle can be repeated multiple times and can be applied to chunks of the problem being addressed, depending on the need. The beauty of brainwriting is that it levels the playing field immediately, and it removes many of the obstacles of group brainstorming. With traditional verbal brainstorming, the number of ideas which can be expressed at once is limited, and the time it takes to get through a number of ideas is much longer, which results in many participants forgetting or becoming confused while others shout out ideas. This is especially so for those who are shy or introverted or who may be at a disadvantage due to being less senior or unfamiliar with the specialisations being discussed. Brainwriting is an excellent starting point for ideation sessions, and can serve as a means to maximise the initial braindump, or as a way to refocus if other ideation methods go haywire. Before the chaos of group ideation muddles people's thinking, help them get their initial thoughts out in the open with an introductory brainwriting session and use the results later to build on further with other techniques. If you were the facilitator, you’d brief ideation participants upfront on the problem statement, goals and important user insights from previous research and findings. Encourage participants to jot down ideas on their idea cards for 3-5 minutes before passing on their ideas when you make the call. Ideally, participants pass on idea cards 3-10 times depending on the problem statement and goals. This all happens silently and without any interference or communication. Encourage participants to push themselves for more ideas at least a couple of times, in the few minutes they have, in order to maximize the output and variation. You should stoke the session with encouragement and provide questions or statements which push participants to think outside of their comfort zones. The cycle can be repeated multiple times and can be applied to chunks of the problem being addressed, depending on the need. After ending the cycle, each participant will briefly verbally present the thoughts on the idea card he/she ends up with by the end of the cycle to the rest of the team—in order to spark new streams of thinking or combinations of ideas. If you were the facilitator, you would often be taking notes on a white board. When all team members have presented their idea cards, you can select the best ideas which you can continue to build and elaborate on in other ideation sessions. There are various methods you can use such as “Post-it Voting”, “Four Categories”, “Bingo Selection”and “Now Wow How Matrix”. Yes, you read it correctly—don’t worry, though; it doesn’t involve soles touching souls. Brainwalking is very similar to brainwriting with one small but highly impactful difference. Instead of passing idea cards or notes from one participant to another, participants have to get up from their seats and move to another spot around the brainstorming table or even to another table altogether. Bryan Mattimore came up with this technique; he’s a specialist in the art of ideation and facilitation. Mattimore has many years and thousands of sessions of experience conducting ideation sessions. In his book Idea Stormers, he describes brainwalking as the: 'single best technique to use to begin an ideation session'. Brainwalking gets people out of their seats, gets them moving, keeps energy levels up and mixes things up enough so that the group as a whole does not get stuck delving too long down the same one-way street, without a quick exit or U turn available. Brainstorming works best when it is easy to flip or to start from scratch. As we can see, one ideation method leads to another, and another… and the methods themselves are areas open to creative interpretation and disruption. Alex Osborn was an advertising executive who created the technique we know today as brainstorming. He invented the technique as a response to the stifling environment of executive meetings and with the goal of freeing up creative thinking in order to facilitate ideas to flow more easily. Alex Osborn presented the brainstorming technique in his book, How To Think Up. Alex Osborn authored several books on group creative thinking, including Your Creative Power, How to Organize a Squad to Create Ideas and Applied Imagination, and he was a pioneer in the field, laying the ground for what we call ideation today. Alex Osborn developed a system that still applies to our modern ideation methods and includes such principles as deferring judgement or criticism and aiming for a larger quantity of ideas as opposed to a focus on quality. He also impresses the importance of an experienced facilitator and on combining group brainstorming with separate individual ideation sessions. As much as the modern understanding of brainstorming may conjure up ideas of randomised chaos with an untrained, poorly facilitated group just shouting out whatever comes to mind, the technique Osborn developed has many rules and principles, which need to be respected in order to achieve success. Start with a question, a plan or a goal – and stay focused on the topic. Defer judgement or criticism, including non-verbal. Encourage weird, wacky and wild ideas. Build on each others' ideas. Allow one conversation at a time. Take a deep dive into Brainstorming with our course Design Thinking: The Beginner's Guide.